When You Have to Work in Blazing Heat: Do You Really &#8216;Get Used to It&#8217;? When You Have to Work in Blazing Heat: Do You Really ‘Get Used to It’? “You go to Hell and you die!”, the twisted trademark invective of South Park Elementary’s quirky 2nd-grade teacher, “Mr. Garrison“, suddenly made logical sense, but as a conditional prediction, the moment I arrived in Taipei, Taiwan. 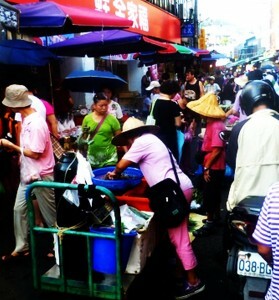 That was four days before writing this, when I felt my first blast of the dreaded and notorious Taiwan summer heat, which has hovered around 95 degrees Fahrenheit (35 degrees Celsius) most of the time. Make that “moist of the time”, because the humidity is so high that breathing feels more like gill-filtering of fish (not to be confused with gefilte fish, which I wouldn’t mind as much ). What has amazed me more than the fact that I have not keeled over yet is how the locals in the open markets and at their stalls can stand all day and/or night over sizzling, bubbling, boiling, steaming, roasting and smoking cooking facilities day after day, night after night, without collapsing psychologically, if not physically, themselves. 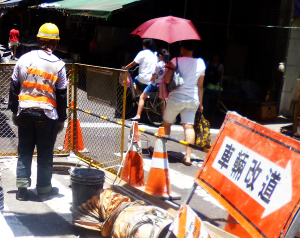 Even more amazing are the construction workers, bike jockeys and others who cannot defend themselves with a retreat into shade under canopies or cool themselves with fans. 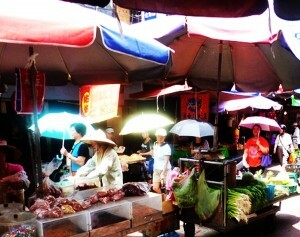 Although the evenings provide respite from the Sun, the heat remains relentless, perhaps sustained in part by the body heat radiated by throngs of people crowding sandal-to-sandal, in the narrow spaces that don’t open up for long in the bustling market lanes —especially during the sunbrella-to-sunbrella daytime jostling. I know I couldn’t do it—work in intense, unremitting heat, or, worse, in heat to which I’m adding more, e.g., by cooking, operating hot machinery or playing some pro-team sport in the heat. I can’t even think straight enough to write anything, except possibly an S.O.S. or the sketch of a last will and testament. I cope with it while writing on the road by not coping: I retreat to my air-conditioned sanctuary and that is the end of that. But suppose I couldn’t or that you can’t: How is coping or adapting to be achieved when evasion is not an option and your job makes you feel like you are shoveling lava in a volcanic pit? Why, of course, you make the effort to or naturally just “get used to it”. Your palms may “get used to” shoveling lava, by developing calluses as a recognized, fairly rapid physiological adaption. The instantaneous perspiration-evaporation-cooling cycle that helps maintain body temperature within a normal, homeostatically controlled range also makes its immediate contribution to heat adaptation. Likewise, automatically increased blood flow to the skin surface helps prevent over-heating of internal organs by dissipating heat outward, from the epidermis. But what about simply “getting used to” the heat over the long term—as opposed to merely “getting resigned to it”? Does that actually happen by some mechanism different from these familiar, limited adaptations to acute, rather than chronic or chronically acute heat, or is getting used to it a mind game of some sort? where M is the rate at which thermal energy is produced by the body through metabolic processes, W is the rate of work produced by or on the body, R is the rate of radiant heat exchange with the surroundings, C is the rate of convective heat exchange with the surroundings, E is the rate of heat loss due to evaporation of body water, and S is the rate of heat storage in the body. Without getting into the complex details of each of these parameters, it is fair to ask how can our voluntary or reflex physiological behaviors not only preserve the equality of both sides of the equation, but also optimize the levels not momentarily and virtually instantly, but gradually over weeks or months? “Getting used to it” is ambiguous in a critically important and mysterious way: It is one thing to say that our bodies adapt through processes that are effective within moments of their onset. These include removing excess clothing, staying well-hydrated, maintaining electrolyte balance, fanning ourselves, automatic perspiration, moving into the shade, eliminating skin-to-skin contact (not only between ourselves and others, but also between our own skin surfaces, such as our exposed arms and torso or our thighs, thereby increasing the skin surface area available for cooling perspiration). But it is quite another to claim there are additional mechanisms that take days, weeks, months or even years to enable us to “get used to it”. What could those mechanisms be? Doubts about their existence are reasonable on the same grounds that proof of their existence can be claimed: natural selection. On the one hand, we, as varieties of humans or as a species of primate, seem to have adapted over millions or even just thousands of years through genetic changes induced by natural selection of adaptive traits that promote survival in and reduce damage from heat and associated radiation. For example, there is increased hairlessness, protective melanin and changes in body size. This is called “phylogenetic” change—change in our DNA , which can be transmitted to our offspring and theirs, as benefits. But individual long-term single lifetime adaption, as opposed to this longer-term species adaptation, is harder to understand from the same Darwinian perspective. There is no “natural selection” within one’s own lifetime, working to our individual (“ontogenetic”) benefit. So, what kind of Darwinian or other “long-term” adaptation are we talking about when we claim that we can get used to heat over a period of days, weeks, months or years—the latter being especially mysterious given the obvious benefits much faster adaptation would offer, e.g., in a very hot, debilitating climate? On the other hand, it may be physiologically efficient to have heat adaptation to take longer in order to assure that the changes and their metabolic and other physiological costs required to adapt are not “invested” in by our bodies when the abnormal heat or other conditions are purely transient. Hence, our bodies may “wait” until the cumulative time or stress is demonstrably both intense, frequent and persistent enough to warrant substantial physiological (as opposed to behavioral) changes, e.g., in the salinity of perspiration and urine, as adaptive-protective responses. Apart from the obvious answer that we learn to mimic the locals who have been raised in the sweltering reference environment, e.g., by dressing, napping, eating and drinking, traveling, fanning and use of “sunbrellas” (UV-proof umbrellas), what exactly is it that we are doing when we “get used to it”? —a notion that always gets trotted out, as though it were perfectly clear. As for those who do get used to it, how much of that getting used to is psychological—e.g., revised standards and expectations of comfort or simple acceptance of the brute fact that the heat will persist, rather than anything physiological? REDESIGN: Make adaptive changes in your environment. These include grabbing a sunbrella, moving to the shade, picking up a fan, changing your work schedule so as to include a siesta during the hottest part of the day, shedding items of clothing, working in a chilled bath or diving into a pool on a work break. REFRAME: Like the convict told to “get used to it” as the door of his solitary cell is slammed shut by a guard, you can try to cognitively, emotionally and volitionally “reframe”, i.e., reinterpret your experience so as to make it more bearable. Possibilities for both the con and you include treating the brutal experience as a test of will, interpreting aspects of it as positive (for example, as a sweat cleanse or toughening), or as an ordeal with an end date. RESIGN YOURSELF: This sounds like conceptually the simplest, but may actually be the most challenging, psychological response—simple, fatalistic acceptance of the situation as is, with no comforting mind tricks, no adaptive maneuvers apart from raw acceptance of the facts, nothing at all apart from simply putting up with the heat (or whatever else you’re expected to “get used to”). The frequency with which this tactic or response is utilized may be hard to gauge, since, for some reason, we almost never hear anyone say, “Oh well, you eventually put up with it.” That’s despite the fact that, at bottom, putting up with it may be what it really is—for many, if not most people. RESTORE HOMEOSTATICALLY: This comprises the automatic virtually instantaneous physiological responses that serve to restore bodily parameters to normal, if not optimal, values, such as sweating to keep body temperature from rising dangerously. Consider this instantaneous “getting used to”. REWIRE PHYSIOLOGICALLY: “Rewire” is used loosely here to designate physiological adaptive changes that occur automatically, although, unlike rapid homeostasis, only gradually, over days, weeks or months, as part of the process of “acclimatization”, without any required behavioral changes. —“These findings indicate that short- and long-term acclimatization are mediated by different physiological mechanisms. Furthermore, the liberal sweating that occurs after weeks of heat exposure in unacclimated subjects has been attributed to an increase in the sensitivity of the sweat glands to thermal and hormonal stimuli, and an increase in the size and/or number of active sweat glands (Nielsen 1998). [http://www.ncbi.nlm.nih.gov/pmc/articles/PMC2788658/](Emphasis is mine). —“The results in both studies showed that the subjects in the tropical region were found to have significantly lower mean skin and body temperatures than the subjects in the temperate region. The tropical subjects are able to maintain lower core and skin temperatures compared to temperate subjects due, in part, to a lower metabolic rate resulting from lower thyroxine secretion” (Onaka et al, 1978).” [Ibid.] (Emphasis is mine). So, “getting used to it” in the rewiring, long-term homeostatic adaptive sense appears to be a real phenomenon, although not equally applicable to all of us, relative to our genetic makeup, to where and to what we are attempting to adapt or perhaps to our physiological/physical idiosyncrasies, e.g., a large body with a high volume to surface area ratio that makes heat dissipation harder for, say, an elephant than for a mouse. My hunch is that where none of the other four of the “5R” forms of “getting used to it” adequately account(s) for the adaptation, rewiring, in my intended sense, will be the likeliest explanation. Hence, if you find yourself trying to “get used to” working in extreme heat (or any other horrible workplace condition) when you must and others around already have, go through the 5R checklist with them to see whether you can do more than hope for eventual rewiring or put up with it. 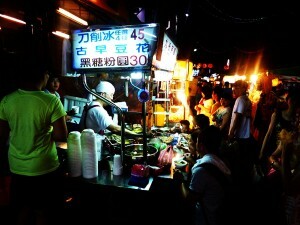 …unless, of course, it is in Taipei and even hotter elsewhere there. Note: See the companion article, “Blinking on the Job Not Allowed—The (De)Merits and Bounds of Extreme Job Discipline” for more on coping with the challenges of extreme work conditions.